2-Bed, 2-Bath. Short Walk to Private Beach access and pool. All you need is your swimwear and beach towel to begin enjoying the breathtaking beaches here on Hilton Head Island! This is a gated community with 24 hour security. I would like to point out here that there is NOT an elevator in the building, and our villa is on the third floor. The tennis buildings are not disabled accessible. There are two bedrooms, the master with queen-sized bed, with private bathroom. The guest room has two single beds, with access to second bathroom. Linens are provided. Bathrooms both have tub/shower combinations. The villa has a full kitchen with dishwasher, stove, and fridge with ice-maker, and microwave oven. Relax on the balcony overlooking the stocked lagoon, and maybe you will spot the resident alligator! As you come to the end of the day, you may want to take advantage of the many restaurants on the island. There is a sports bar on the resort, along with a beach bar and grill, and even pizza delivery should you just want to stay home for the evening. Just around the corner from your villa is a children's playground, and charcoal BBQ grills, and picnic tables for your enjoyment. Located close to the tennis courts and villa is the pro shop with a new fitness center, and coin operated laundry facilities. If you are a little more athletic, or would like to try something new..there are ten lighted tennis courts available for free (just call for reservation) or you may take advantage of tennis lessons with the tennis pro! Hilton Head Island is famous for its network of bike trails/walking paths, many of which are tree lined - a wonderful way to explore the island. Bike rentals available on site - for around $25 per week. Whatever you are looking for for your vacation, you can find it, here in paradise! PLEASE NOTE - During the spring and Summer months we do not accept reservations that split two weeks (over a weekend). We do accept less than a full week requests, but within the Saturday to Saturday time frame. Keywords: Condo, condominium, villa, apartment, 2-bed, 2-bath, beach, private beach access, ocean, lagoon, pool, tiki bar, sport bar, 24 hour security. My husband Phil and I, moved to the US in 1988 from England. We have two grown sons who live close by, a young Grandson and soon to be Granddaughter. Phil is a shift foreman at a mine preparation plant, and I am a retired RN. Our favorite things to do include walking on the beach whenever we can, I enjoy painting, paper crafting and sewing. My husband still plays football, or should I say soccer, and he referees the high school kids in the fall. Although we live a fairly long drive from Hilton Head Island, we fell in love with the place after visiting in 2008. We try to visit as often as possible, but we would rather share this wonderful place than let it sit empty when we are unable to visit. Although none of the beaches on Hilton Head Island are private, Hilton Head Tennis and beach Resort have their own private access. We enjoy sitting and walking on the beach, and with the white sand and warm water lapping at your feet, it is paradise! The villa is located close to the ten lighted tennis courts, which are available for free, just call the pro shop to book a time. We played tennis here for the first time in too many years to mention, and always try to fit some into our schedule when we visit. Private beach access. Resort has several eating opportunities. Largest ocean side pool on island. Bike rental onsite. Beach/pool bar and grille. 24 hour gated security. Resort has own private beach access. Villa does not have beach view. 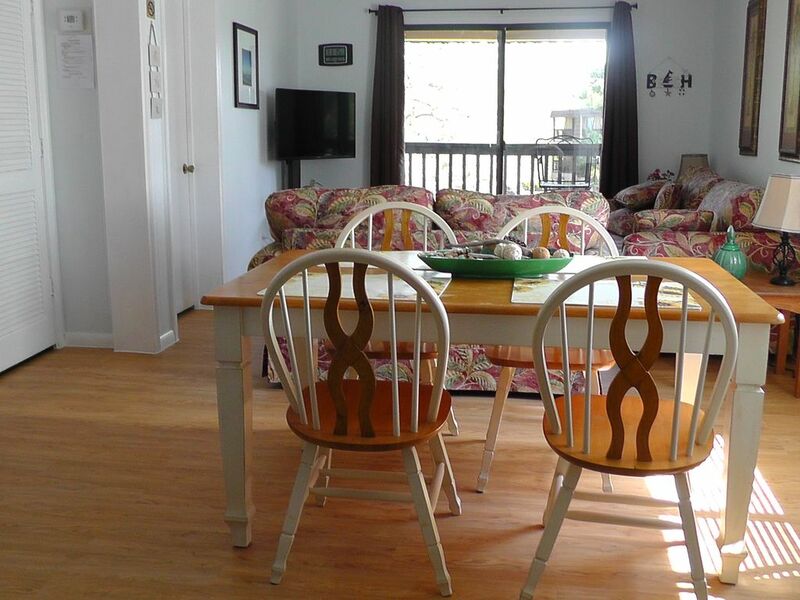 Villa is short walk to beach access. Free local calling. May receive long distance calls only. Linens and towels provided. Please bring your own pool/beach towels. Ten lighted tennis courts available for free - just call ahead for reservations. Tennis pro on site for lessons. New fitness center. Coin operated laundry facilities. Children's playground. Charcoal grills. Lagoon with resident alligator - all within a few steps of condo. Bike rentals on site. great little place close to the beach with a great pool. we had a great weekend and we have no complaints. Resort was good. Similar to 3 star hotel. The toilets did not flush and needed to be plunged often. Plenty of food places within walking distance. The pizza place was very good. Coconuts was the worst service imaginable. The beach was the best part. Sand was soft and the water was beautiful. Kids loved the huge pool. The trip to the lighthouse and the harbour side was one of the best spots on the trip. Took advantage of the bike trails and enjoyed the beauty of nature that is so prevalent on the island. The condo was servicable but the couches were not comfortable to relax on. Only had comforter and one blanket in closet. Owner messaged that cleaning service removed twin comforters due to kool aid stains from previous guests. She said the maid would come by with replacements which she never did. So, we had kids in 2 twin beds and fold out couch having to fight over 2 blankets. Even though the condo was on the third floor there was a full set of stairs leading to the first floor so basically you are on the fourth floor. The kitchen cabinets had plenty of dishes. However, every cabinet was full so we spent time rearranging so we actually had space to store food. The whole place needs some updating and deep cleaning. This condo was a great fit for our family with 4 younger kids. It was an easy walk to the beach, pool and playground. The condo was clean with a well supplied kitchen and an overall good setup for our family. Would definitely stay here again! Thank you for your kind review. We are very happy you enjoyed your stay at HHI and that our villa fulfilled your needs. It is important to us that our guests enjoy their stay as much as we do wehn we are visiting, and any suggestions are more than welcome. Thank you again. Has 6 wash clothes and we have a family of 4 so if you stay more than one night need to stop by dollar tree or Walmart to buy some wash clothes or wash the ones provided daily. Nice apartment for just getting away and having family time. Very outdated but has necessary things to make your stay manageable. The Master bath shower did not work so we were stuck showering in one bath. Not sure when the air filters were last changed but several vents were dusty and we woke each day with allergy like symptoms. The place did have some extra kids toys/boogie boards/games/dvd's. We are obviously distressed that you had problems during your stay. But we heard nothing of any maintenance issues during or after your stay. It is impossible to address repairs or any such issue if we are not aware there is a problem. We take honest photographs that are posted with the details of our villa, so you can determine if this is a good fit for you and your family. I am very sorry we did not live up to your standards. Thank you for being honest and posting a review. Restaurants for every taste and budget. Art gallery with regular activities. Cleaning Fee included in weekly rates. Anything less than 7 nights add $80 cleaning fee. Taxes (11%) and security/Insurance not included. Please note that during Spring, Summer,and Fall we do not usually take reservations through the weekend - meaning, eg. Friday through Sunday, as this makes too many other days unavailable to other guests. Guests should note that weekly rates are from Saturday to Saturday. Any requests for other days will be considered according to availability. Booking guests should be 25 years of age.